In 1958 after graduating from the Ural State University, Vadim Mikhailovich began working at the Institute of Metal Physics as a laboratory assistant. Since 1982 has served as a head of the physical metallography lab after retirement of the Member of the Russian Academy of Sciences V.D. Sadovsky. In 1964 he defended his candidate’s dissertation, and in 1976 - a doctoral dissertation on the theme ”X-ray diffraction and electron microscopic examination of structural heredity in steel.” In 1977 he was awarded the Doctor degree in Technical Sciences. And in 1987 he received the title of professor majored in Solid State Physics. In 1990, V.M. Schastlivtsev was elected an Associate Member of the Academy of Sciences of the USSR, majored in Metallography; in 2003 he became a Full Member of the Russian Academy of Sciences with a degree in Physical chemistry and Inorganic Materials Technology. V.M. Schastlivtsev has contributed to scientific and technical progress by solving fundamental issues of metallography and heat treatment theory. His area of activity is the study of metal alloys. His research interests lie chiefly in two issues: the phenomenon of structural heredity in steel during heat treatment and supercooled austenite transformations under cooling. In other words, he deals with martensite, bainite and pearlite transformations. Works of both V.M. Schastlivtsev himself and carried out jointly with his disciples are of outstanding importance. Using direct methods for examining the structural heredity in steels, he experimentally proved that austenite grains are able to ”restore” themselves when heated, i.e. the orientations of the initial and newly formed austenite grains coincide with crystallographic ones. Also, he has found experimentally and theoretically justified that oriented austenite nucleation forms when heating steel having the initial martensitic structure. V.M. Schastlivtsev has studied in detail the austenite recrystallization process due to phase (internal) hardening; discovered and thoroughly explored the manifestation of the structural heredity and subsequent austenite recrystallization in steels with the initial pearlitic structure that contains an excessive phase in the form of cementite and ferrite; described the effect of ultrafast laser heating on the structural recrystallization in steels with different initial structures; has been the first to observe experimentally the diffusionless formation of austenite in steels with the pearlitic structure during hyper-speed heating. Studying the structure of lath martensite being the basis of most high strength steels, V.M. Schastlivtsev has made an important contribution to the theory of martensitic transformation. His works are devoted to determining the structure of a packet of martensite crystals. He has been the first to discover places of occurrence of retained austenite in the lath martensite structure and showed the influence of cooling rate on the position of martensitic points in steels at high speed quenching and analyzed the features of the martensite structure formed under the influence of a magnetic field. In his papers, V.M. Schastlivtsev shares new information about other products of supercooled austenite transformations. Namely, he has established experimentally that, in the bainite transformation temperature range, the polymorphous gamma-alpha transformation exhibits a step-by-step nature in iron-based alloys, depending on cooling rate. Experimentally and theoretically he has analyzed the causes of the multi-step dependence of the temperature position for the start of the transformations in steels on cooling rate. Patterns obtained are used to analyze the relationship of the martensitic and bainitic transformations in alloy steels. As a result, the new concept proposed by V.M. Schastlivtsev makes it possible to prove that the existence of the upper and lower bainite in steels are genetically related to the presence of several kinetic stages of the gamma-alpha transformation in iron rather than to the change of the structure of separating carbides, as previously thought. He also has investigated and described carefully the carbideless bainite structure formed in medium-carbon steels and the causes why steels with such a structure change their properties non-monotonically when tempered. While conducting his experiments to know much more about the peculiarities of perlite transformation in high carbon steels, V.M. Schastlivtsev has revealed that a low-temperature perlite at temperatures below the bainite transformation can exist. Also, it has been found that the solid-solution hardening of the ferrite component of the “fresh” perlite takes place. The “fresh” perlite is a perlite formed immediately after accomplishing the eutectoid transformation and not suffered relaxation processes, which inevitably happen after any phase transformation. The results of these works are: carbon steels with such a structure have a diverse set of mechanical properties and very good wear resistance; the perlite structure changes in a special way when low-temperature annealed, with the ferrite component becoming polygonizated and recrystallized; there exists a rapid cementite spheroidization process, accompanied by the emergence of ferrite hardening followed by its recrystallization. V.M. Schastlivtsev and his colleagues carry out their explorations of structure and properties on single crystals and pseudo-single steels and alloys. This allows one to obtain new information about the phase transformation mechanisms, the mechanical properties, the structure changes occurring at both low and extremely high degrees of plastic deformation and not achievable in a polycrystalline state. The results of the research are used to enhance heat treatment of steels in order to improve the impact toughness and durability of products. They have proposed regimes of low-temperature thermomechanical isothermal treatment of constructural steels, heat treatment of cryogenic steels to obtain a reverted austenite, which provides the high notch toughness of welded joints; found optimal regimes of isothermal treatment of medium-carbon steels to obtain carbideless bainite; determined regimes of recrystallization of low-carbon welded steels of electroslag remelting to increase the notch toughness. Many fundamental and applied investigations have been carried out by V.M. Schastlivtsev collaboratively with other research groups and industry enterprises. Some metallurgical and machine-building enterprises have gained significant economic benefit through the above developments. V.M. 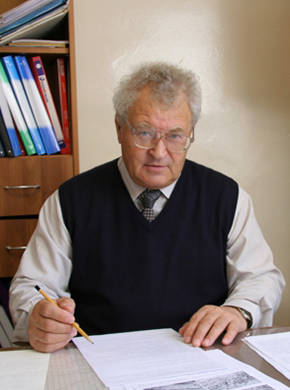 Schastlivtsev has published more than 330 scientific papers, including 7 monographs, about 195 articles in peer-reviewed journals, has inventor’s certificates. Works of V.M. Schastlivtsev on the study of structural heredity in steel, a martensitic transformation, and a relationship between martensitic and bainitic transformations are recognized in our country and abroad, included in monographs and textbooks. Vadim Mikhailovich is a member of the International Advisory Committee of the International Conference on martensitic transformations. V.M. Schastlivtsev attaches great importance to the coordination of research in the Urals region and the training of scientific personnel. He has supervised 3 Dr.Sc. and 14 candidate theses. Executing honorary duties, since 1986 he has been an academic advisor of an institutional and academic laboratory based on the Department of Metallurgy and Solid State Physics at the South Ural State University and the Physical Metallurgy Laboratory at IMP UB RAS. The staff of the laboratory has obtained important results on the kinetics of polymorphic transformation in iron alloys under superfast cooling, has published three monographs. The employees of the laboratory have received several Doctor and Candidate degrees of Sciences. V.M. Schastlivtsev has been delivering lectures in the Ural Federal State University. In recent years, Vadim Mikhailovich is a chairperson of Ural metallurgist-heat treater schools working regularly. These have long since attained wide fame and are an important link in the coordination of research, as well as a meeting place for young and venerable scholars. In 1976- 1992 V.M. Schastlivtsev is a member of the editorial board of the journal “Physics of Metals and Metallography”. Since 1992 he has been the Deputy Editor. Now, he is a member of the section of the Scientific Council of RAS on new construction materials, as well as of two Councils for the defense of doctoral theses, namely, at the Institute of Metal Physics and at the Ural State Federal University. In 1990, V.M. Schastlivtsev in collaboration with V.D. Sadovsky, a Member of RAS, and others was awarded the D.K. Chernov Prize for the monograph “Laser heating and steel structure”. In 1996, he co-won the Prize of the International Academic Publishing Company “Nauka” for the best publication in its journals, and in 2004 he was awarded the V.D. Sadovsky Prize of the Ural Branch of RAS in the field of metallurgy. Among other awards of V.M. Schastlivtsev there are the Order of “Friendship of Peoples” (1986), and the Medal “Veteran of Labour”.